These stoneflies, known for their roach-like shape, are not really mentioned in books about angling. 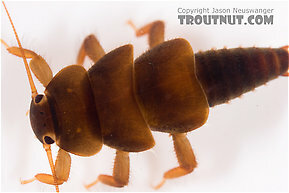 They are a major component of the invertebrate fauna in a few streams, which are presumably few and far between. 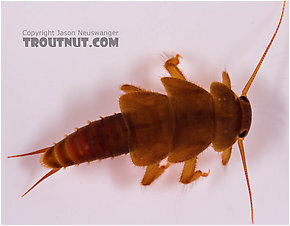 Since their robust shape is so distinct, I speculate that a special nymph pattern would pay off on the rare waters where they are major insects. Peltoperlidae (Roachflies) Stonefly Adult View 5 PicturesThe adult stoneflies of this family look surprisingly normal given the strange shape of the nymphs.